As I type this I am wiping up the last of the parmesan shavings with my finger and sharing onion bits with little miss Charlie. She kind of likes frittata. Preheat your broiler. In a small saute pan, heat the olive oil and brown your onions. Not over the top, but until they look like they are ready for fajitas. In a small bowl, whisk together the eggs, parsley, cheese, paprika and season with salt and pepper. Pour mixture over onions, moving the pan around so that the eggs completely cover the onions. Cover and throw under the broiler for about eight minutes. 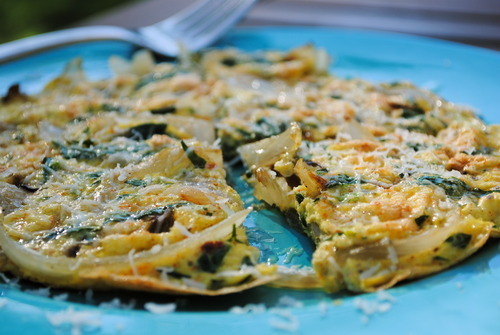 Gently slide the frittata onto a plate, give a nice glug of olive oil to the finished dish and shave fresh parmesan on top. Hello weekend.